Now available: My new Star Wars story in RISE OF THE EMPIRE! New Star Wars fiction alert! I've been working hard this year on my Star Trek: Prey trilogy for 2016, but I did some commuting between galaxies to provide a new short story for Star Wars: Rise of the Empire, available Oct. 6 in print and e-book release. Rise of the Empire is a massive 700-page compendium that collects the two canon novels from 2014, my own Star Wars: A New Dawn and James Luceno's Tarkin — and fills in some blanks with short stories by Melissa Scott, Jason Fry, and myself. It's the perfect place for new readers who want to catch up on all things Imperial! My story, "Bottleneck," is set between Tarkin and New Dawn (and it appears physically there in the book) — and it depicts a pivotal meeting between the Grand Moff and Count Vidian, the villain from New Dawn. It was great to get to return to the Vidian character — and without giving anything away, it was a lot of fun to depict another new favorite in there as well. Saturday Oct. 10, 2-4 p.m.
Saturday, Oct. 17, 10 a.m.-5 p.m.
500 N. Harbor, Milwaukee, Wis.
Saturday, Oct. 31, 1-3 p.m. When people have asked about my favorite characters in this series to write, I have often included Lucien Draay – perhaps a puzzle to those who only knew him from his earlier appearances. Following the release of “Homecoming,” essentially a solo Lucien tale, my preference may make more sense to some. He’s a very fun guy to write. I had wanted to do a single issue focusing on Zayne’s pursuers in which he didn’t appear, and I wanted to do it right in the first year, putting a finer point on what they were about. A couple of previous comics served as mental models for this. And one of my favorite comics stories of all time, period, is Neil Gaiman’s Hob Gadling story reprinted in Sandman: A Doll’s House. It’s a single issue which revisits the same characters in one time period after another, leaping years at a stretch. It’s an interesting device, and while the structure of “Homecoming” differs in that it’s a present-day drama interlaced with flashbacks moving forward in time, I enjoyed the opportunity to do something in a related vein. And, indeed, it was of my favorite issues to write in the series to that point. But “Homecoming” nonetheless had its twists and turns behind the scenes. Another twist came long after my work was done. The plan had been for Dustin Weaver to work on #7-9, which Brian Ching worked ahead on #10 – which this issue was announced as. But when the scheduling situation meant that Brian got done first, we reversed the issues – which was fine, since there was little to change to make that happen. 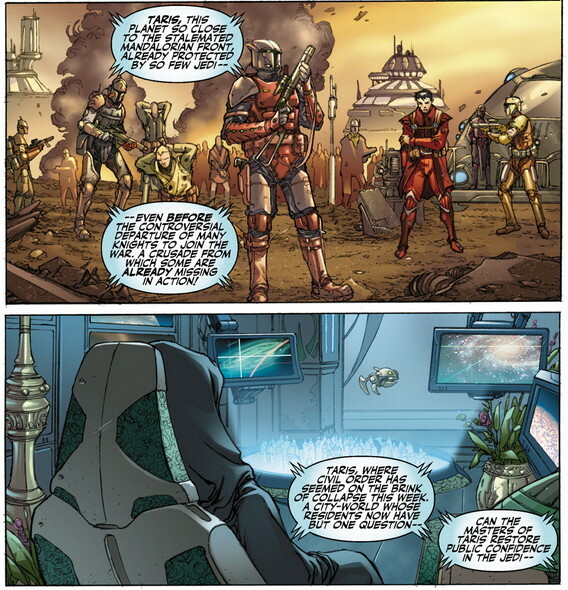 The two issues were essentially happening simultaneously on opposite sides of the galaxy. Ironically, I finished the script for #10 before #9 anyway, so this actually is reflected in the release order. We wound up titling it "Flashpoint Interlude: Homecoming" in the monthly comic book. The #9-10 switch was a good, low-impact solution; low enough that readers didn't always notice when we corrected the order. The first two Dark Horse reprintings put "Homecoming" after the end of "Flashpoint," restoring the intended order -- whereas Marvel put the pages in order of release when they did the Epic Collection in 2005. • This issue marks the turning of the calendar from “approximately 3964 years before the Battle of Yavin” to “approximately 3963”; the Onslaught, taking several days, actually straddles the 3963-and-a-half year mark, so the whole battle is “on the cusp.” We didn’t deal in months in the KOTOR era, which can cause a bit of confusion, since people might have read the cover note and thought a full year has passed. I’m not sure it was a problem for most, though. • Krynda (rhymes with “Brenda”) ties up this series with the Tales of the Jedi era more tightly than ever before. Vodo, Exar Kun, the Miraluka, and more came from that line of comics. • Haazen is pronounced “HAH-zen,” and someone in the design stage made the joke that his last name was “Daag.” Someone else read that, believed it for a moment, and wondered if we would get in trouble with the ice cream company. Relax – he’s not Haazen Daag, except in our imaginations! • I decided after the release not to get into who’s sitting where in the High Council. Yes, as usual, we populated it with faces that fans may find familiar – but, as ever, with a few exceptions, if you didn’t hear the name in dialogue, I did not intend to provide the name in that issue. (I mean, we can hardly call the roll in a situation like that! • On the other hand, we do name Master Vrook, voiced by Ed Asner in the games. I don’t mind if you hear his voice as you read his words – I certainly did! • I was very pleased that Brian could work in the late Padawans into the “courtroom” scene, as I’d hoped. Imagine a trial where the accused has to stand there staring at the hologram of the victims! • Several people noted the novelty of the word “revanchism,” but it was pretty familiar to me in my political science days. Related to the French word for “revenge,” it literally means a policy of trying to regain territory lost in war. It’s a shade different from another word, “irredentism,” which captures that meaning plus the idea of gaining control of areas not lost in war, but which are culturally or historically connected. (It’s based on the Italian word for “unredeemed,” referring to Italian-speaking areas in other countries.) You might say that Nazi Germany’s desire for Danzig was Revanchist, while its desire for, say, the Sudetenland, was irredentist. • I didn’t put sound effects into the fight scene, but it plays pretty well without them. It’s always hard to tell when even a little “Biff! Pow! Oof!” is enough. I tend to be overly fond of “Gaaaah!”, as if you haven’t noticed by now. • They always said I couldn’t see the writing on the wall. Look closely at the scene from Haazen's chamber and see if you can. No, it’s not Artoo and Threepio there in the hieroglyphics – they’re busy in Raiders of the Lost Ark’s Well of Souls… but there is some grafitti there. I didn't catch it at the time, but Brian worked in "John J. Miller" and "Jables McBeat," (which I believe was the nickname of someone working on the title), into the wall design! Next time: A return from our detour, back to the conclusion of "Flashpoint." Or you can skip ahead and read all the notes for the series, though they're only updated up through this issue. • First, I'll be doing my first Virginia signing on August 4 at 7:30 at the Rocky Run Middle School, 4400 Stringfellow Rd., Chantilly, Va., on behalf of the Fairfax County library system. Preregistration for the event is currently closed as we've maxed out the occupancy; I mention the location because it is a new, larger venue than the one we started with. • Next, I'll be attending Shore Leave in Hunt Valley, Md., August 7-9, where I am slated to do a number of signings and panels. I'll post my schedule online when I have it. Update: And now I have it! 11 a.m. Writing in a Shared Universe (Hunt Room): This is the seminar I did at Star Wars Celebration ion Anaheim. Here's your chance to see it if you missed it! 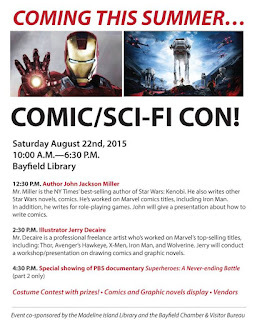 • Finally, on August 22 I'll be in Bayfield, Wisconsin appearing at the library's Comic/Sci-Fi con. My first time to the shores of Lake Superior and I believe it is the first event of its kind up there, so I am definitely looking forward to the chance to see everyone. 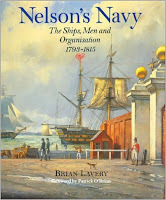 Finally, note that for the next couple of weeks, Overdraft: The Orion Offensive is just $1.99 on Kindle. Click the link to get it! The fourth issue took Zayne and company to the Rogue Moon, and I was very pleased with how this issue turned out, to say the least. Brian Ching and Michael Atiyeh really captured what I had imagined for this entire sequence. The only real surprise for me this issue was the book club insert, which appeared in domestic copies -- but then, I had that happen before in Iron Man #77, which is another of my favorite issues, so it's generally a good sign. 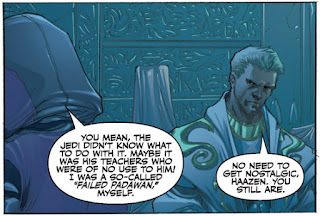 The heart of this issue -- and as some might view it, the whole story arc -- is Zayne's conversation with Master Vandar, a character he feels should be on his side. I loved using this opportunity to smack Zayne with yet another possibility -- that he had committed the crime without knowing it -- and to suggest to the character that, whatever the truth, this wasn't going to be solved quite so simply after all. Beyond those two major elements, I felt it was important to take a few pages and establish the "working relationship" within the crew of the Last Resort. Much like in Episodes IV and V, this group of passengers is more or less stuck with each other -- and I really wanted to take the time to show them bouncing off the walls, as it were. The "shoving you out of the airlock" scene, with Jarael growling, Gryph preening, and Zayne wishing it would all go away, is one of my favorites. • The appearance of Taris from orbit incited some comment from one reader, who didn't feel it looked like the video game version. I think, rather than industrial lava flows like we see on Coruscant, we're looking at city-canyon lights (or perhaps the flames from the riots). • I was actually expecting to hear about the debris field we clearly invented for the Taris system. I had an explanation all ready to go about how one wouldn't expect to see an debris field closer to a sun, like this one, from Taris -- look how big Venus looks from Earth, and then think about how often you see Mercury! But it never came up. 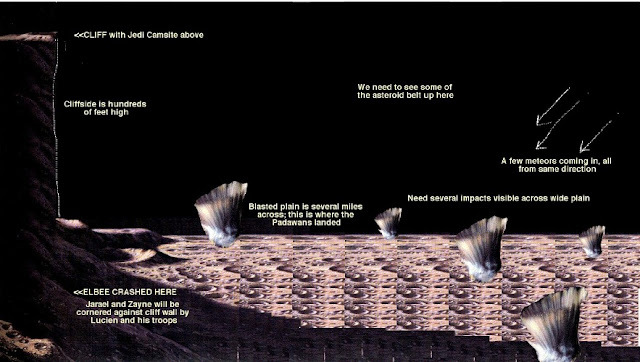 • In general, asteroid fields in Star Wars tend to be improbably dense with debris, at least compared with our Solar System's model. Between the gravitational influences of Rogue Moon, Taris, and other bodies in the system, rocks ought to be cleared out of the ring pretty quickly. One might speculate this debris system is fairly recent, as astronomical time is concerned. 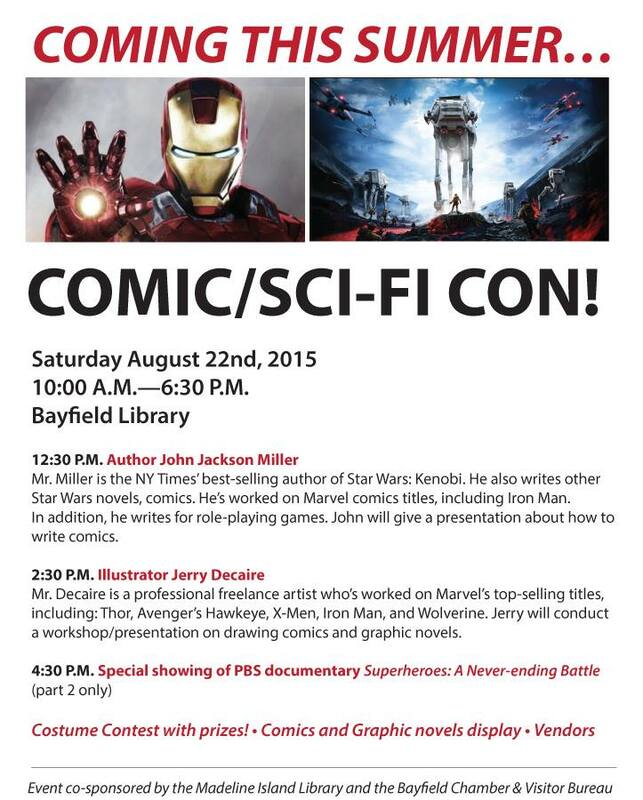 • Note that Zayne's lightsaber turns itself off on page 3 as soon as he releases it. I actually had thought to have it bonking around dangerously as they stumbled around -- but it turns out that, even in this era, lightsabers had kill switches. • The comm system panel from page 6 is duplicated on page 7. Jarael should've known better than to leave Zayne alone with it! • The notion of leaving the asteroid field to make a clear transmission hearkens back to Episode V, obviously. I'm not entirely clear on why that should matter to a subspace communication, but we followed that lead. I loved the "interference lines" Brian and Michael built into the hologram. • I don't know how often it rains on Dantooine, but that really captured the mood. There are enough gardens about, you'd assume it happens sometimes. • The Zhar who informs Vandar is, of course, Zhar Lestin from the video games. I kept getting their names mixed up in the very beginning working on the series; something about the sounds of Zhar and Vandar Tokare, I guess. 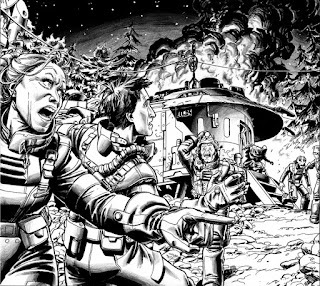 Zhar would appear in the final issue of the War miniseries, years later. • Obviously, the dream sequence in #3 fits in with the Padawans' release onto the Rogue Moon. This is literally like jumping out of a starship without a parachute, since the Moon's relatively weak gravity and lack of atmosphere make such a freefall survivable using simply booster rockets. The landing of the Lunar Module on the moon was somewhat the same; you just need the retro rockets to cut the acceleration enough as you're descending. • Some have noticed the lack of fire and brimstone associated with the rocks plunging down onto the Rogue Moon. That's the lack of atmosphere at work. There are certainly concussions with explosive force, and they do generate heat and dust -- they just don't look like Earthly meteor strikes, with flaming contrails. • T1-LB's name is in part, a nod to the T3 series, as much differently seen in the first video game. 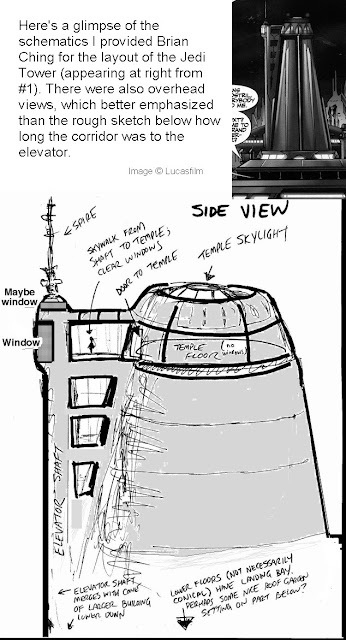 We have actually seen T1-LB units before, in #2, on the cargo deck in the Jedi Tower. I discuss the other half of the inspiration in a later post..
• The fifth-class droid classification is from one of the sourcebooks. It makes sense that there would be a hierarchy for droids with various capabilities, and there was. Next week: Read the story behind the art change in the fifth chapter. Or you can skip ahead and read all the notes for the series, though they're only updated up through this issue. Back from the detour into "Crossroads," the third issue of this storyline found us moving from Zayne's flight for survival to his fight for answers -- and brought in two new characters in the form of Jarael and Camper. In collected format, the role of third chapters changes completely, fitting in much more organically. That poses, in fact, a temptation comics creators actively have to resist -- it'd be easy to tell a 132-page story and just chop it up into comics-sized chunks without mind to where things are breaking in the serial. As a comics guy, I do work to make the story play "both ways" -- Episode V was a completed thought despite leaving almost every big issue "To Be Continued" -- but it's not always desireable to give every chapter exactly equal amounts of action, revelations, etc. Here, chapter three very much is about getting the pieces in place for the revelations to come -- although we made sure to pause along the way for some comedy and action. Brian's Jarael is a pretty fearsome opponent! Jarael, again, had been designed earlier by Brian Ching, and I had noted at the time that she had looked different from other Arkanians; she had pupils, for example, as well as five fingers and elfin ears — and she also had tattoos which I had no explanation for. Further, the initial color key gave her alabaster skin, different from other Arkanians. Rather than ask for changes, I decided to figure out ways to make those differences part of the story. 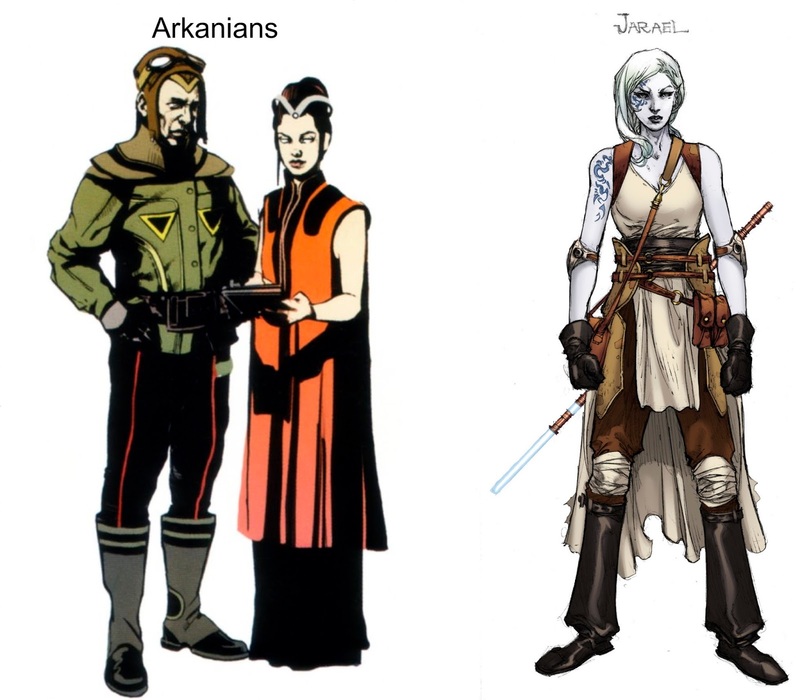 In fact, part of three different storylines would explain Jarael's different appearance. It's just like they say about bakers -- when making cookies, you can eat your mistakes. Some readers noted Zayne's mood shift this issue -- from his earlier denial and despair to anger and resentment. That seemed perfectly natural to me -- especially when you've gone through what he has in the last day or so! Others immediately began talking of a Zayne/Jarael romance here -- although at this stage, the characters seemed unwilling to breathe the same air! It was during production of this issue that we paused to do the Knights of the Old Republic/Rebellion Special, lengthening the production time, somewhat. But it still came out right on schedule, thanks to everyone involved! I did a release-day signing of this issue at Comics and Collectibles in Memphis. 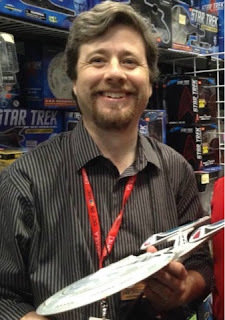 It was my first shop signing associated with the series. • The Rakghouls of the Undercity come directly from the first video game, of course. They would later become central to the events of "Vector," two years later. • Arkanians were one of the first ones added to the milieu by Dark Horse years earlier. The species name wasn't mentioned in this issue, but it was actually revealed back in Dark Horse's initial slide-show about the series. As a result, some readers at the time did ask about the fact that Jarael has pupils,which previously depicted Arkanians didn't. • With the mentions of Feln and Xamar, our five Masters finally had their names. I spaced them out so as not to hit everyone with a dozen names in the first issue. Feln's name was exactly two letters off from the first initials of my sister's four kids; Xamar just sounded cool. • Lhosan Industries is the company represented by the alien, Jervo, seen in #1. He would turn up later on in the second year of the series. • Sharp readers may have noticed that Zovius Mendu was mentioned in the text page of #0! • There's no way that the stars above Taris would be visible in the scene on the final page -- the planet's dayside is too bright -- but as most movie producers have found, it just looks odd without them! Next week: We head for the Rogue Moon. Or you can skip ahead and read all the notes for the series, though they're only updated up through this issue. 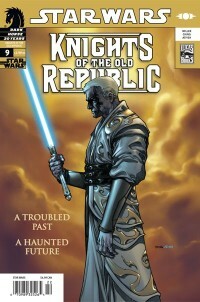 Issue #0 of Knights of the Old Republic came out after #2, but in my own mind — and in all the reprints — it is the first chapter of the Zayne Carrick story. 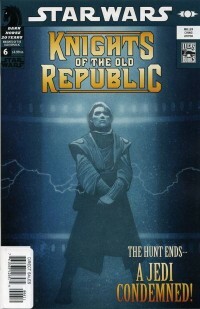 As I got further into the first Knights of the Old Republic storyline and began to firm up more of my later plans for the series, I realized I had material for a prologue story to help new fans get their bearings in this timeframe. Focusing as it does on Zayne’s personal situation, the first issue touches on such things as the Mandalorian Wars only tangentially and the previous Sith War not at all. Even presented out of order, a prologue, I figured, could fill in a few blanks without interrupting the forward motion of Zayne’s story for flashbacks. In 2005 I had suggested to Dark Horse the possibility of doing such a prologue as some kind of promotional comic book. My initial thought had been the Free Comic Book Day issue for 2006, but with the day coming so far into the year — the first week of May — Editor Jeremy Barlow rightly suggested doing a 25-cent special much earlier. While it wouldn’t be a preview for Knights of the Old Republic, the other half could preview Rebellion, another upcoming title — and the KOTOR side would be a welcome addition for fans excited by the just-launched series. The first pencilled page from Brian Ching. So we set to work, pausing between regular issues to get the special written and drawn. It was very much worth it, I think – thematically and visually, it is of a piece with the rest of the series. Dark Horse would later do #0 issues for Legacy and for Knight Errant. I remember being startled at how every name mentioned in the Holofeed had Wookieepedia pages created for them within a week. That really brought home to me that everything mentioned anywhere in the comics was going to be important to someone. It also motivated me to avoid using Tuckerisms as much as possible later in my work: every one-off namedrop was going to be indexed again and again! The news feed was not reprinted in any of the Dark Horse editions, but it was reprinted in the first Marvel rerelease in 2015. It may seem ironic that this short story and its news page provided more hooks for the continuity fans than did the first two issues that had already appeared, combined. Again, that was completely intentional on my part: I had said before that readers did not have to have played the video games or read the previous comics in this era to enjoy the series. This special provided those who have with a few more referents — even if there are still secrets I had yet to reveal to completely put everything in context. 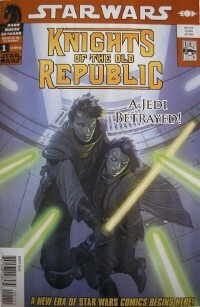 • The actual title of this issue, from the indicia, is Star Wars: Knights of the Old Republic/Rebellion #0. 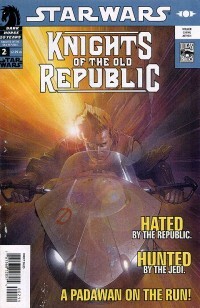 • The cover of this issue – the KOTOR side of it, anyway – is a recolored version of the sample image Brian Ching created for the 2005 Dark Horse presentation at Comic-Con International: San Diego. The colors are a little brighter in this print version. 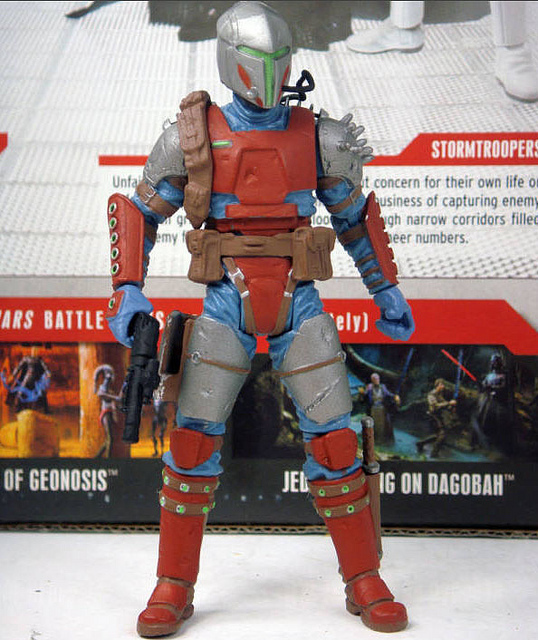 It would later become the cover for the first Marvel Legends Epic Collection in 2015. • The “Cap’n Karath” mentioned is, right away, a reference that will be familiar to players of the first video game. We would see a lot of Saul Karath in the series that followed. • Dark Horse kindly provided a thousand copies of this issue for a 2006 convention which, thorugh some miscommunication, only wound up using a fraction of that number; over the next seven or eight years, I used the remainder whenever I needed a freebie comic for a kid at a signing. It took that long to go through them all! • Yes, Marn Hierogryph is the Baron Hieromarn of the fleek eel story – obviously. Who else would want hard currency delivered to a hotel night desk clerk? Next week: We go back to "Commencement" for Part Three. Or you can skip ahead and read all the notes for the series, though they're only updated up through this issue. The second issue of a series always tends to be easier for me to write than the first issue. The scene has been set, the characters have been introduced – now the action can begin. At the time, however, I don’t think I had done a second issue with quite so much action right out of the gate. The first 16 pages of this issue are all essentially part of the same sequence, starting in the Jedi Tower and winding up in that grungy alleyway. One of my decisions in the beginning, to avoid using an omniscient narrator except for announcements as to location and time, becomes more noticeable in an issue like this, where there are several action scenes without an opportunity for dialogue. In the old days, it would have been a simple matter to throw in a thought balloon from Zayne explaining exactly what he’s doing at any moment; today, things need to be a lot more self-evident. (I wrote more about the disappearance of the thought balloon and of many narrator captions in my column in Comics Buyer’s Guide #1596.) That said, I think Brian Ching really carried off what was a pretty complicated action scene very well! Brian Ching's pencils of the page 2 scene. Brian’s depictions in fact really helped sell a lot of my favorite scenes. We really do get a better sense of Gryph’s priorities and assumptions about himself. And, wow, isn’t he Mr. Empathy when Zayne’s friends appear on the news? I would begin using an omniscient narrator for setting descriptions after "Vindication," to underscore the galactic travelogue aspect of that phase of Zayne's career. • The inside cover of the issue accidentally referred to Brian Ching as the cover artist instead of Travis Charest. 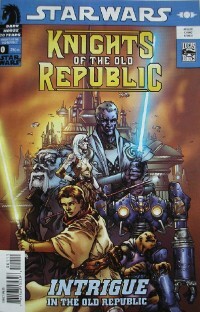 Incidentally, this would be the correct line-up for the Star Wars: Knights of the Old Republic/Rebellion Special, which shipped a week later. • This issue gives a prominent on-camera role to Master Vandar Tokare, a character from the first video game. Despite his Yoda-like looks, his manner of speech differs, just as it is depicted in the game. Vandar would appear several more times in the years to come. • The dialogue balloons in the “garbage can” scene are actually reversed with regard to where Zayne’s and Gryph’s knuckles are. It takes an eagle-eyed reader to notice how hairy a guy’s fingers are! • The Kedorzhans make their first appearance anywhere in this story. I would return to the species later in my 2013 short story for Star Wars Insider, "Incognito" — a tie-in with the Star Wars: Kenobi novel. It involved Obi-Wan encountering the Kedorzhan senator in the aftermath of Episode III. 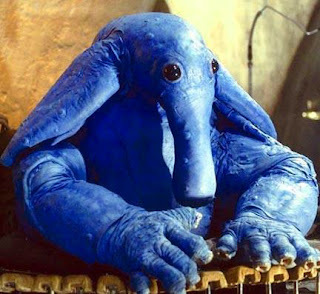 • A Bith, as Gryph mistakenly refers to the Sith, is of course a member of that race that also includes the Cantina Scene’s band from Star Wars: Episode IV. Next week: We actually go back in time, to #0, which was published after #2. Or you can skip ahead and read all the notes for the series, though they're only updated up through this issue. 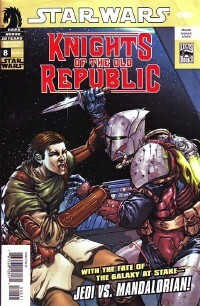 In honor of the July 1 rerelease by Marvel of the Star Wars: Knights of the Old Republic comics, I'm revising and updating my production notes here on what I hope will be a weekly basis. 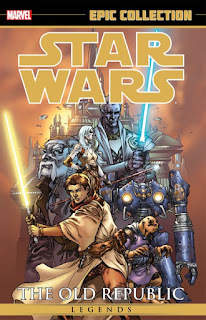 You can get Star Wars Legends Epic Collection: The Old Republic Vol. 1 from your local comic shop, from Things from Another World or from Amazon. You can also purchase signed copies directly from my shop while supplies last. 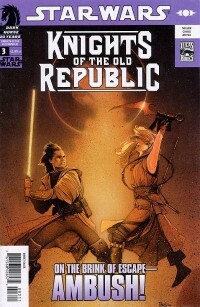 Long before I came into the picture, Star Wars: Knights of the Old Republic began as a video game series – and before that, a sub-genre of Star Wars comics from Dark Horse under the Tales of the Jedi label. 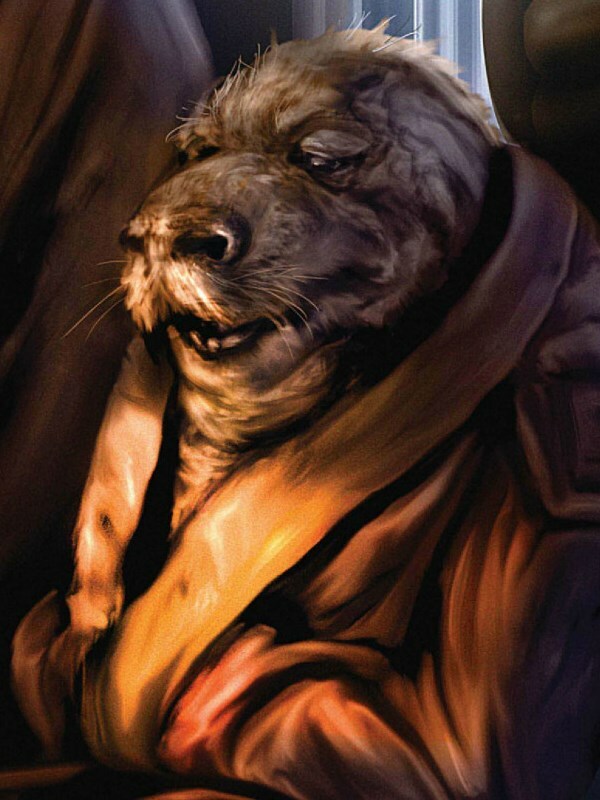 My involvement began in early 2005, when editor Randy Stradley and I began discussing some of the features we liked seeing in Star Wars comics: camaraderie, humanity (even among aliens), and drama, among other things. That conversation led to my putting together some thoughts for a series to be launched during Dark Horse’s 20th anniversary in 2006 – and, indeed, KOTOR became the first big event of that anniversary celebration. As my plans for the series grew in detail, I changed little from my initial pitch for Randy and my eventual editors, Jeremy Barlow and Dave Marshall (except for a bit about Gryph, below). After approval, I turned in the first script and Brian Ching, who had recently drawn Star Wars: Obsession, went to work. Brian and colorist Michael Atiyeh developed detailed visuals for the series characters – including a lot of important characters that we see in the first issue but that don’t have speaking parts there. By Comic-Con International: San Diego in August 2005, when Dark Horse announced the series, much of the first issue was done – and I had already scripted well beyond that. The lead time allowed me to concentrate much more on story flow and pacing than I’ve had the opportunity to do in the past. 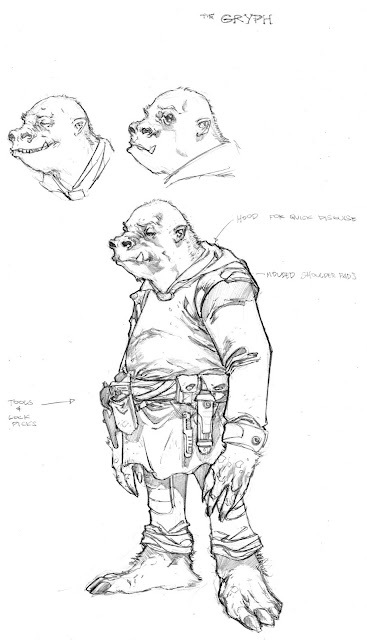 For the most part, Knights of the Old Republic is told as economically as I can manage, with very little “flab” – most every detail included either means something or is deliberately in there because it doesn’t. I was also able to work out much broader plans for how this series fits into the overarching continuity, which readers will be able to better see as we go forward. After what felt like a long wait, the first issue released exactly on schedule: Jan. 25, 2006, 363 days after Randy and I had that initial conversation. Amazingly, we managed to keep the particulars of this issue’s surprise ending secret almost up until the release. Initial sales were brisk with wonderful reactions from fans to the mysteries the issue posed. 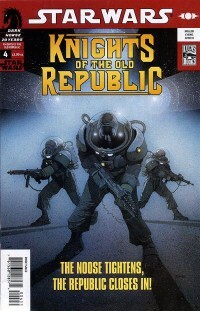 In 2007, the issue was reprinted in Knights of the Old Republic Vol. 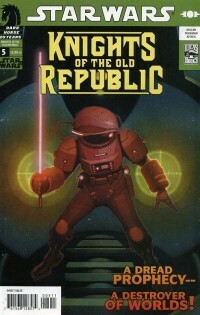 1 from Dark Horse; in 2013, it became part of the first Star Wars: Knights of the Old Republic Omnibus. The cover from this issue would become the cover for both of those. 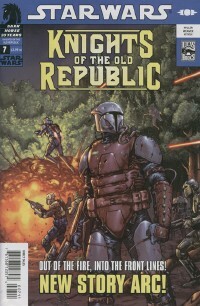 On July 1, 2015, Zayne Carrick made his first appearance at Marvel as the publisher released the issue as part of its Star Wars Legends Epic Collection: The Old Republic Vol. 1. • In my first draft, Gryph was a member of the Ortolan species, the same as blue-elephant Max Rebo from Return of the Jedi. Clever crooks are supposed to be fairly rare for that race, giving Gryph an opportunity to play against type. But Brian Ching quickly realized it would be hard for Gryph to convey the many expressions my story required without a visible mouth, so I went back to the casting room. I’d always liked the Snaggletooth action figure from the first movie, so it took me less than an hour to suggest that Gryph be a Snivvian. It turned out to be great move for all involved, and a good example of how collaboration in comics works. The very first Gryph drawing, by Brian Ching. Not an Ortolan! • If you read closely, you can see how out of step the honest citizens of Taris are. The businessman refers to the Highport area remaining safe, when in fact we’ve just seen what Gryph is doing there! 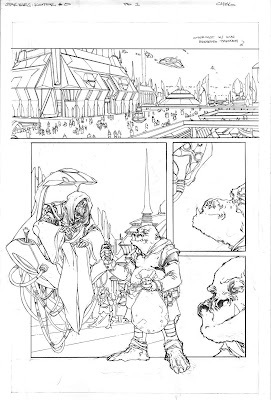 • I considered the double-page scene that preceded it — the one with the Padawans' deaths — so hot for the fan press that I deleted Brian’s preliminary drawing from my hard drive, in case I accidentally e-mailed that image by mistake! • We worked hard to get Zayne’s and Lucien’s expressions just right for the final page. I think Brian managed to hit just the right notes – because there are several there. 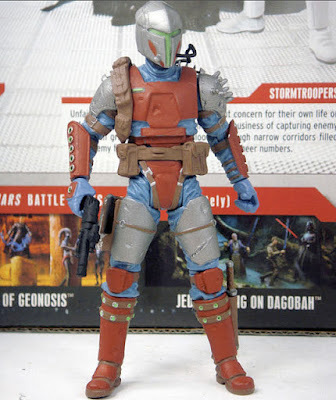 • I managed to get the start date of the Mandalorian Wars wrong by a year, a consequence of my misreading something in one of the game files. We wound up working that into the story, and it became the "False War" period when we described it in the 2008 Campaign Guide. • There is no scene in the comic book like what we see on the cover of this issue, but it was drawn a good bit before the rest of the comic book was. It was a fine piece of artwork, in any event — and it makes Zayne seem a lot more competent than he actually was! Next week: Read about issue #2's opening action scene—and my choice to avoid omniscient narrators. Or you can skip ahead and read all the notes for the series, though they're only updated up through this issue.